Long ago I ordered risotto at a an Italian restaurant because I wanted to try something different. Since then I have enjoyed risotto in many forms, mushroom, seafood, spinach and even squid ink risotto. Another very well known Mediterranean dish. Risotto is creamy and rich and could be enjoyed with white or red wine. Risotto could be served as the main dish or can be a side with suggestions of salad, grilled chicken, or steamed veggies. Soak dried mushrooms in 1/2 cup hot water for about 15 minutes. Bring soup broth to a boil then put it in a back burner on low and keep warm. In a large sauce pan melt some butter and a glug of olive oil on medium high heat, add celery and garlic and sauté. Add the rice and a pinch of salt, stir constantly with a wooden spoon in order to coat all the grains with the oil. Add the brandy or wine and stir until absorbed. Add the mushrooms with the hot water and the sliced mushrooms. Add the leaves from the thyme. Add a ladle full of stock and stir, add another ladle full and stir until almost all the broth has been absorbed by the rice, continue to add broth continue repeating this process and stir until liquid gets absorbed, keep stirring–this process will take about 15 minutes. Add broth, stirring constantly until almost all the broth gets used up, taste the rice and check to see if it’s al dente and creamy. Add a pinch of salt, tomatoes, peppers and the rest of the liquid broth, turn off heat and add some butter and parmigiana cheese. Cover pot with lid and allow rice to steam for about 5 minutes while you prepare the table and plates. Taste the rice and adjust seasoning with salt if needed or more cheese.. put more cheese on the table for guests to help themselves garnish their dishes. Other finishes are more thyme and olive oil, freshly ground black pepper. Please enjoy with your loved ones or family and friends. Please comment and include which wine you drank and weather you used brandy or wine. Let me know if you served with side of meat or veggies, salad etc. This is a summer dish, but because of the winter we’re having so far I think I need a taste of summer. Turlou turlou means “all mixed up” in Greek. This resembles a vegetable casserole, similar to Briami or French Ratatouille, or even a Sicilian Caponata. Moms version is done in a pot on the stovetop instead of the oven. Even though my father was a hunter and liked his wild game this happened to be one of my dads favourite meals. I use cilantro here but flat leaf parsley is more common. You can omit the beans if you cannot find them, also I use a chilli for some heat and squash but again it’s not that traditional. Classic Mediterranean Diet food, (olive oil, veggies, tomato, herbs). This is a very healthy meal as a meal in itself or a side or appetizer for fish, chicken, rice, pasta or even a salad of mixed bitter greens. Allow the eggplant to be the star here… should be the most important vegetable in Turlou Turlou. Okra, sweet potato, cauliflower and a few other veggies would all work but I’ve personally never tried them. Have fun a please comment. Thank you. Wash all the veggies (tomatoes, eggplant, zucchini, carrot, peppers, squash, potatoes) and chop into 1″ cubes but DO NOT peel the skin off any vegetables. Set aside cubed veggies in a large bowl tossed with a couple big pinches of sea salt and a couple glugs of olive oil. Using your hands mix everything together until well coated in oil. Heat a large pot or Dutch oven over medium high heat, add the a coating of oil and begin to fry the onions and half of the garlic. Toss in half the veggies and begin to gently stir with a wooden spoon for about 3 minutes until all the veggies have had a chance to touch the bottom of pot and are well coated in the hot oil-onions-garlic. Add in the remaining veggies and keep stirring gently for a few more minutes, now add the remaining garlic, sugar, tomato paste, oregano and chilli pepper if using. Lower the heat to simmer, cover the pot and allow to steam for about 15-20 minutes. Uncover pot and mix the veggies, add the herbs and using a fork pierce a bean, potato or squash to make sure that they have softened to your liking. Turn off the heat and if mixture is too dry mix in a little water, taste and adjust salt and pepper to taste. If you want it to be oily, add more raw extra virgin olive oil or to preferred individual serving plates and garnish with more herbs. Soutzoukakia are a classic appetizer or as they say in Greek meze. I’ve been making a version of this for over 20 years and there’s always a chance to get creative. You can choose to substitute veal, venison, ground turkey or even pork. Change up the herbs to parsley or dill instead of mint, add in chilli flakes or cayenne for spice. Double the recipe and use a large crock pot for a big party. You could substitute the cheese to any hard to semi-hard cheese like pecorino, Parmesan, Gruyere, or Romano. I like to serve this with crusty bread or pita but there are many options as they can be served over rice or pasta, with salad or a side dish with roasted vegetables. Heat half the oil in a large pot over medium heat and add onion, garlic, carrot, celery and tomatoes and cook for five minutes, add wine and continue to cook for 5 more minutes. In with remaining ingredients except remaining oil. Lower heat and cover the pot and allow to simmer for at least 1 hour. Toast the bread one hour before needed and let sit at room temperature to dry out. For the meatballs, grate in the garlic and shallots in a bowl with meat mixture, mix in remaining ingredients except for bread. Using your hands crumble bread into meat and knead mixture well for a few minutes. Preheat oven to 400*. Shape meatballs to the size of a small egg and place them all on a cookie sheet in the oven and cook for about 20 minutes until brown on the outside. Take meatballs out of oven and place them all in the pot of simmering sauce, try to scrape all the bits off tray into pot as this adds tonnes of flavour. If sauce is too thick add some water, turn up the heat and cook sauce for 5 minutes. Turn off the heat and stir in remaining oil. Serve meatballs warm, sprinkled with more dried oregano and enjoy with dry red wine, crusty bread or pita. These “little shoes” are awesome, they are named little shoes as there appearance is like classic kids shoes. Some people like to make them with no rice and lots of meat covered in béchamel and cheese, like moussaka. I like to use a little meat and rice with lots of herbs, maybe a little cheese. This can easily become vegetarian dish substituting a couple diced veggies instead of sausage meat. Note: if you cannot find chorizo, Italian sausage will do. Remove the casings off the sausages and fry the meat in a pot over medium heat for about 5 minutes continuously stirring and breaking up the sausages along the way. Toss in the garlic and a couple glugs of olive oil. Stir in the rice, pepper and half of the salt, turn up the heat and add in 2 cups of water and bring to a boil. Toss in the herbs and tomatoes and turn heat to lowest setting, cover and steam rice for about 15 minutes until rice is al dente. Cut the eggplant in half length wise and chop off the stem. Using a spoon scoop out the inside of the eggplant and discard the seedy parts, just try to keep the eggplant meat that is less seedy and chop to a dice and add into pot of rice. Pre-heat oven to 400*. In a large enough baking dish to hold the four eggplant halves, add a spoon of oil and arrange the eggplant face up and season generously with salt and pepper. When rice is ready pour out any remaining liquid and taste it to make sure seasoning is to your liking and if rice is undercooked don’t worry it will continue to cook in the oven. Fluff rice with a fork and add half the grated cheese, some olive oil and mix well. Stuff each eggplant half with the rice mixture and top with more cheese. Add in a little water in the bottom of baking dish, cover and bake in oven for 30 minutes. Remove cover and cook an extra 5-10 minutes until cheese bubbles and crusts the top. When the stuffed eggplant is ready remove from oven and allow to sit for 5 minutes before serving. Best enjoyed with a greens salad and a glass of red wine. Please comment and let me know how you made out the this recipe. This is a recipe that is a classic Middle Eastern/Greek dish, the egg-lemon sauce is very Greek, some use oil and lemon others use sour cream. Herbs are what really make this food shine so be very generous with the fresh herbs. Pine nuts work really well but I have used walnuts with great results. I use wild or brown rice which need about 10 minutes of pre cooking. I use brown rice cause I love the texture, nutty taste and nutrition they provide. Please comment and let me know how this worked out for you, it is time consuming rolling all those dolmathes but put on the radio and have some fun, it’s well worth it. Simmer wild or brown rice in water for 10 minutes with a little bit of oil. Drain and let cool, then add to mixture of white rice and meat. Knead all ingredients in a bowl to combine except lemon juice and 1 of the eggs and 4 cloves garlic. toss pine nuts in non-stick skillet on high for one minute do not burn or brown too much, just enough to extract great flavour, then cut them or crush if preferred and add them to rice and meat mixture. There is no need to boil or blanch the grape leaves unless the jar instructs you to do so. Drain leaves very well, rinse with cold water and separate them as you rinse. On a large cutting board or work surface roll grape leaves up from the stem (cut off and discard stems if long) with small spoonfull of rice mixture, sealing by folding in the sides before completely sealing the top. some defective grape leaves that have holes. beat egg and whisk egg with lemon juice and 4 cloves garlic. 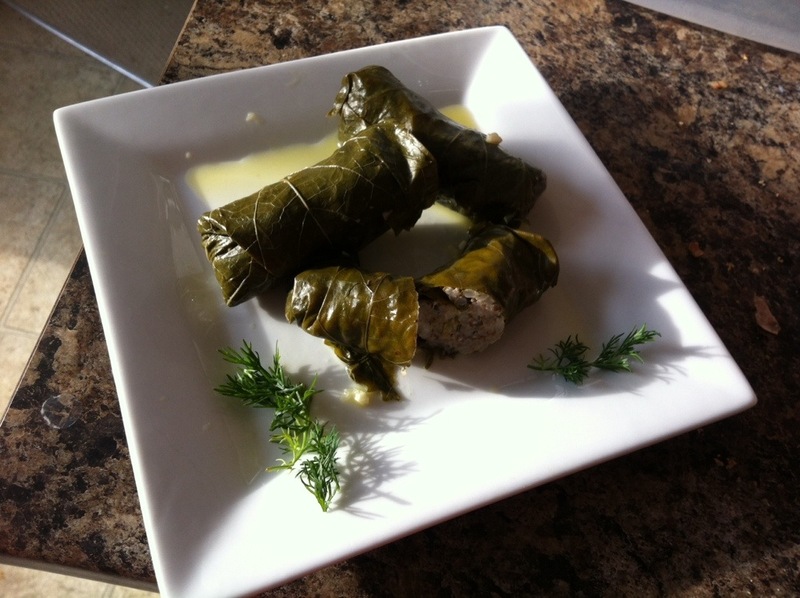 Remove dolmades from heat. Pour some of the liquid from the pot a little bit at a time into egg/lemon sauce while whisking vigorously, whisk in more liquid until all used up and keep stirring until frothy and add olive oil to sauce. Take dolmathes out of pot into a bowl pour egg-lemon sauce over them. 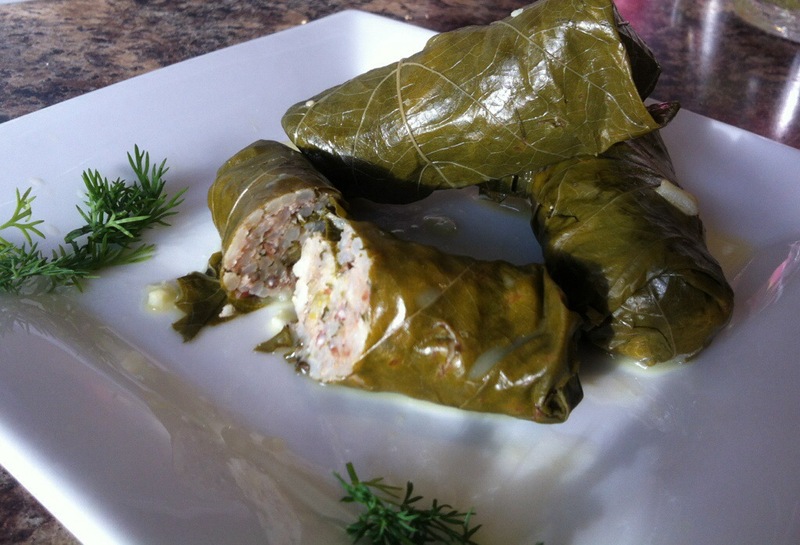 If you are saving some dolmathes for later refrigerate without avgolemono sauce. For a vegetarian version substitute diced, carrot, celery, onion, spinach and zucchini instead of meat.